Apples and pears go together delightfully and fall is the perfect time to indulge in baking them into tartlets for company. I love to make individual tarts because they make people feel so special when you each get your own tartlet. 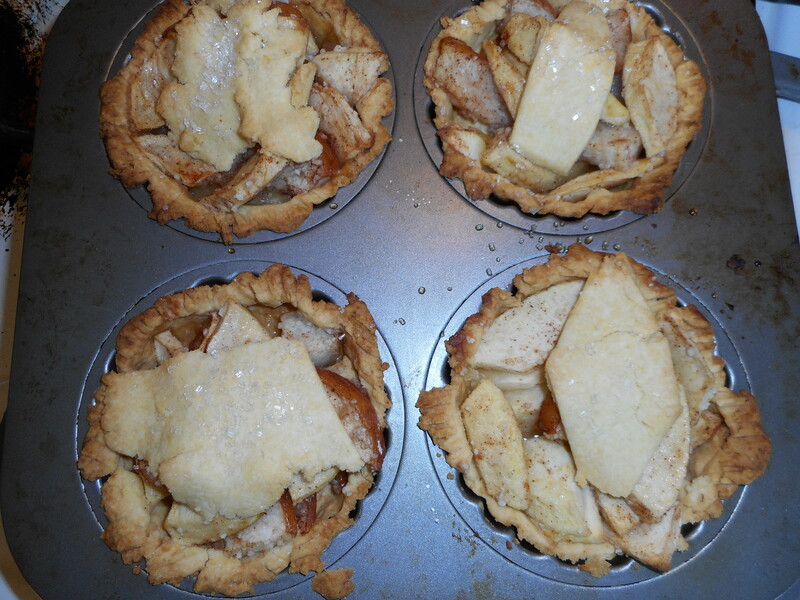 Use what ever kind of baking apples you have. Good choices are red Rome, Empire, Golden Delicious, but no to Fuji, Red Delicious or Gala apples. I got mine from an actual apple orchard (Bechdolts which is south of Hellertown, PA.) I like to buy their small basket of seconds which are cheaper and just as fresh as can be especially compared to grocery store apples. Plus the taste is the same as the fancy unblemished ones in the display baskets. Bosc pears are perfect for baking; great flavor and texture. These are simple tarts: no need to make them perfect looking. I used a fork to press around the crust before I lay the fruit in it. I cut out leaves from the leftover crust to make a sort of a top crust. The coarse sugar adds a certain eye apple and crunch. Enjoy! pie pan, centered. Remove other slice of wax paper. Crimp edges all around. Do again until you have 4 shells and use all the crumb leftovers to make a fifth tartlet crust. I actually do two of them side by side and turn them out onto the tartlet pans together. Repeat for other four shells. 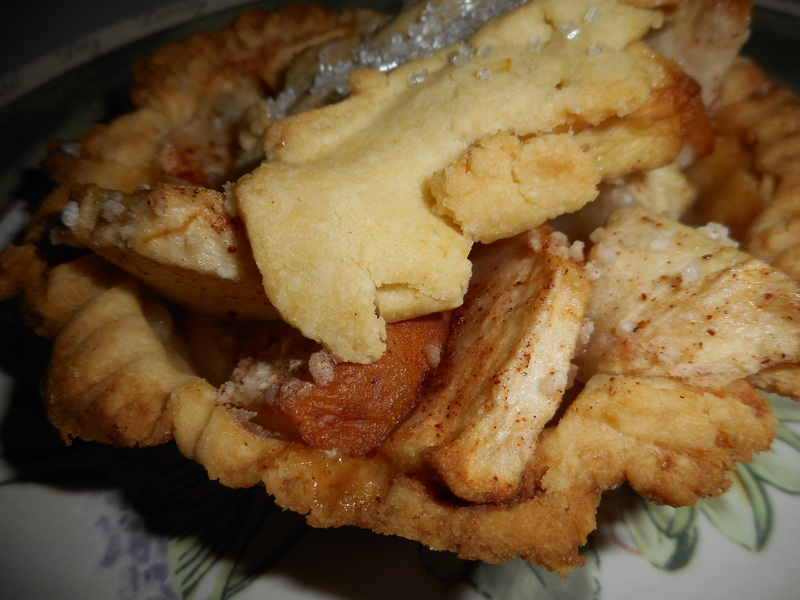 Heap into tartlet shells. Top with a leaf cut out of the spare crust. Sprinkle with coarse sugar. 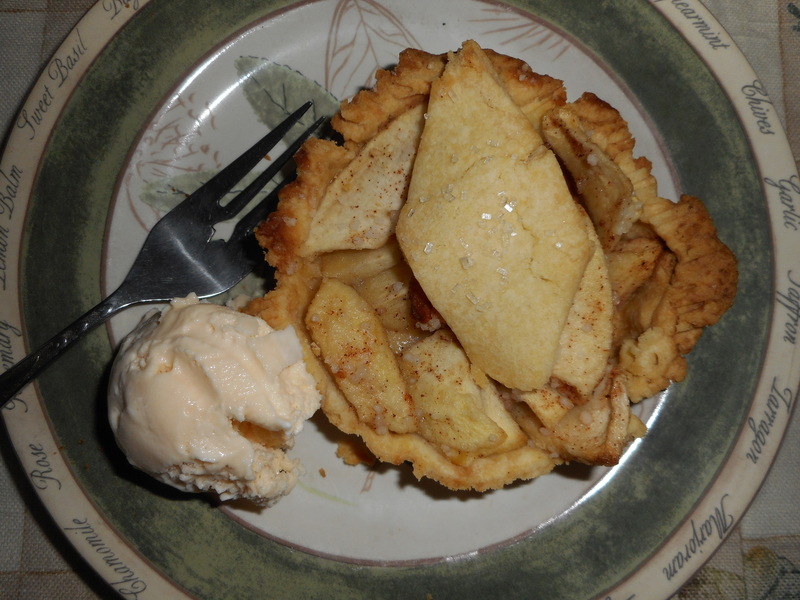 Well, this is my winter dessert Chopped blog post (Food Network show)…. 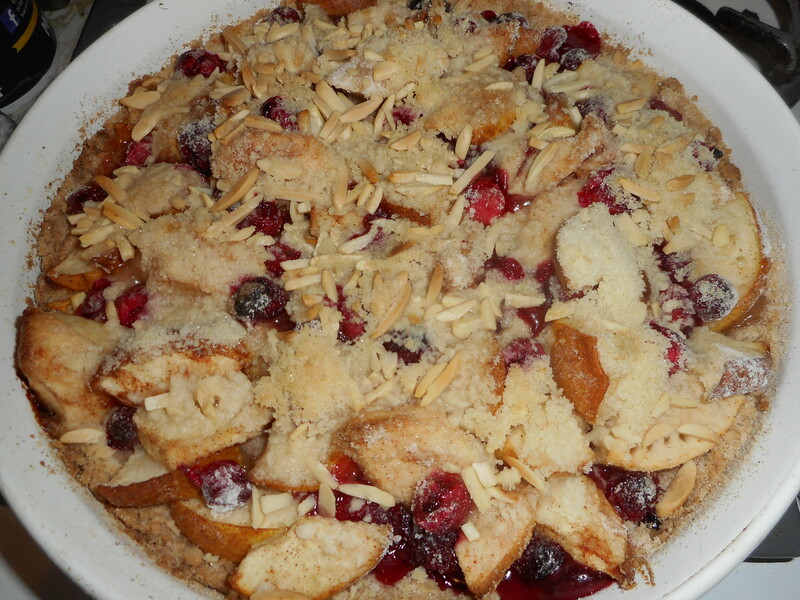 I have some fresh cranberries, two almost ripe pears, one ripe apple, leftover crumb pie topping and slivered almonds. What to make? I didn’t have a recipe that suited those specific ingredients so I threw together this pretty tart with the three fruits for a filling and a very easy topping. Cranberries are good for you and they add a sparkling flavor to the apple/pear mix. 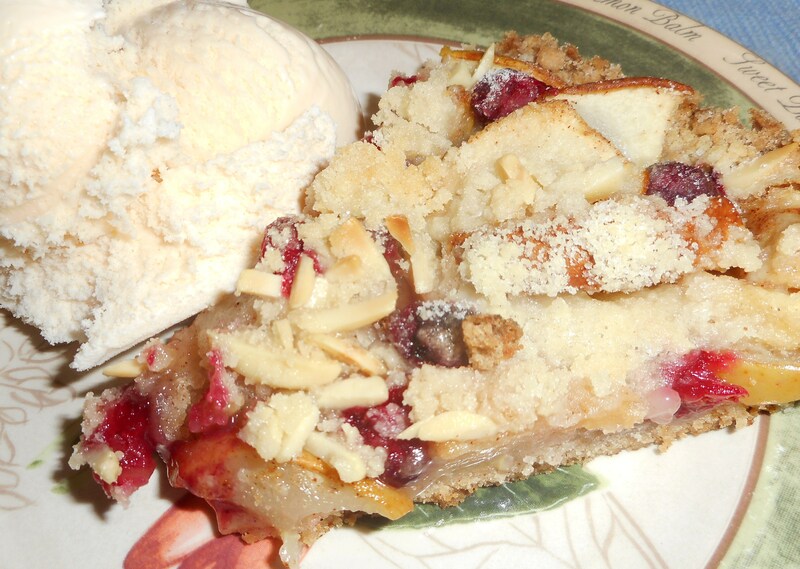 This turned out quite good, there is a crisp cookie crust covered with a mixture of sweetened fruits and a crumb and almond topping. We had slices of it still warm with a scoop of vanilla ice cream tonight; perfect. Someone had seconds! I restrained myself. Besides, I had a bigger slice of tart. And yes, the person having seconds, he does not need to avoid wheat but this tart made him want more! 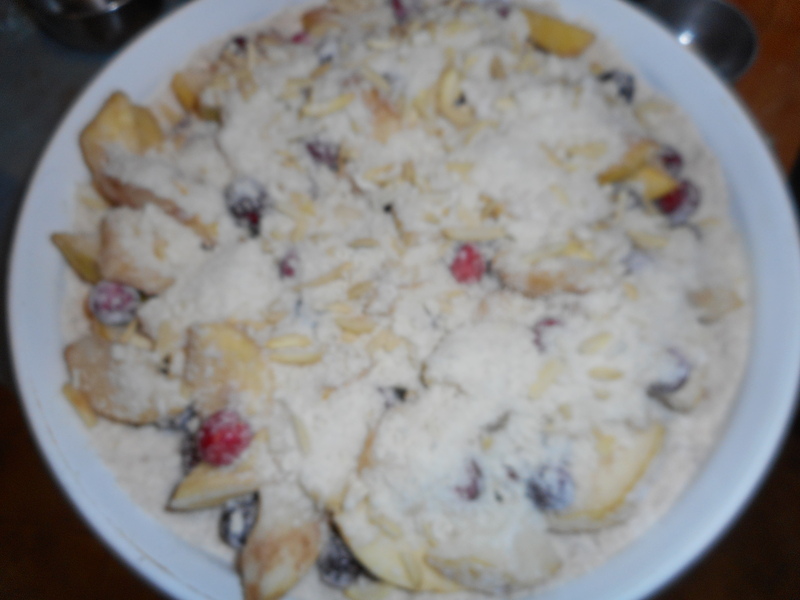 This is a simple recipe; toss the fruit with sugar and flour. And it looks like it came from the bakery. If you make this tart I promise you no one will even believe it is GF. They will just beg for seconds or thirds! I can’t wait to bake it again. Note: we ate the rest of it today, still got but I think it is at best optimal flavor while still slightly warm. I plan to try variations on it using other fruits; maybe blueberries instead of cranberries. But it turned out great for a first time ever recipe. Start by making a gf cookie crust and the crumb topping. Pour into a ten inch tart pan that was sprayed with cooking spray. Spread it up the sides ½ an inch. Press gently in so it is a cohesive crust but do not press really hard or it will be like concrete when you finish baking it! 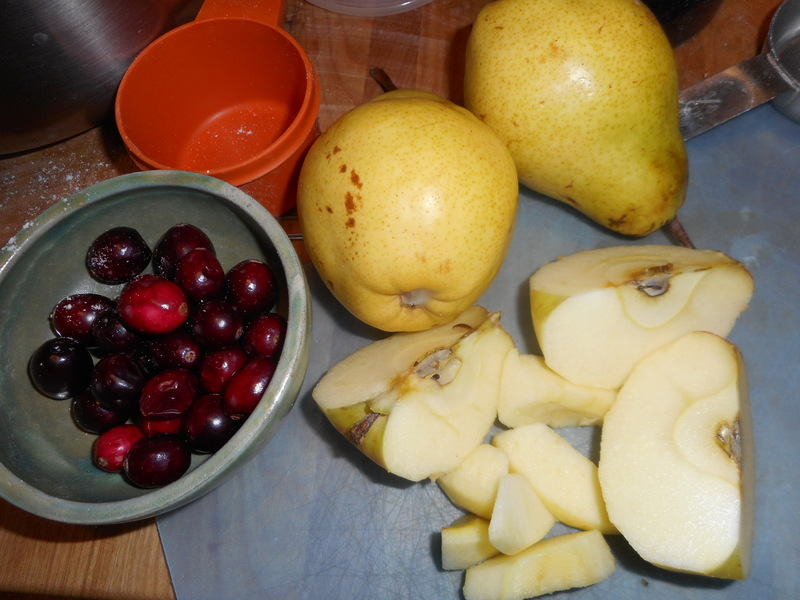 Peel, core and slice thinly the cooking apple and core/slice the two pears, put in a mixing bowl with the washed cranberries. 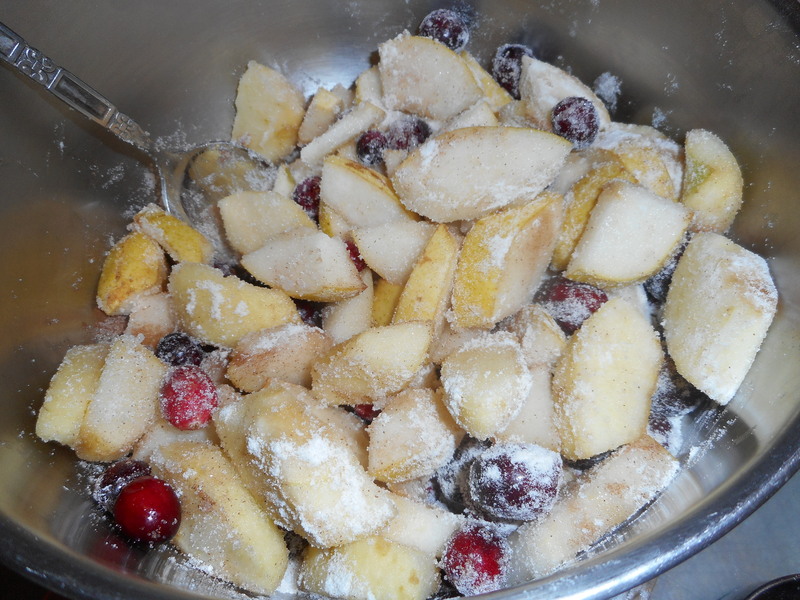 Be sure to pick over the cranberries and remove any soft or iffy ones. 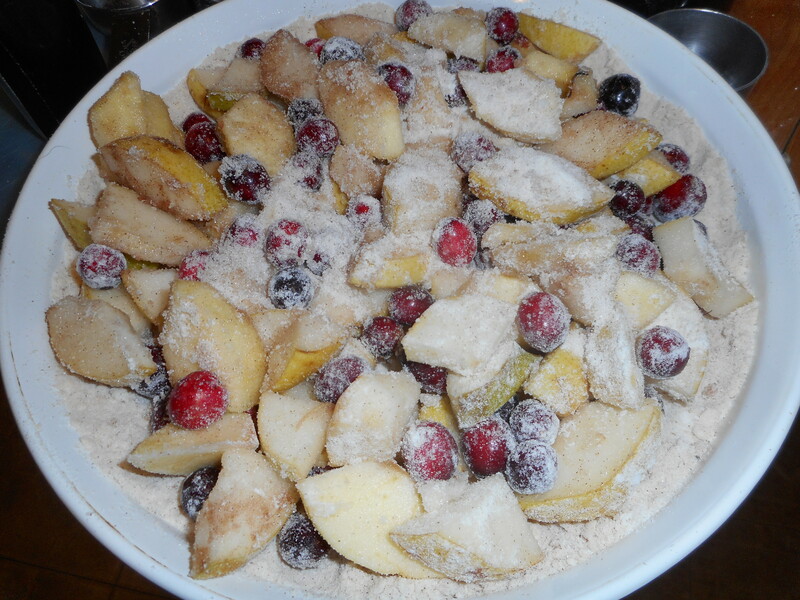 Add the sugar, flour and cinnamon, mix with a spoon to coat the fruit. Pour into the crust. Sprinkle the tart with the almond crumb topping. 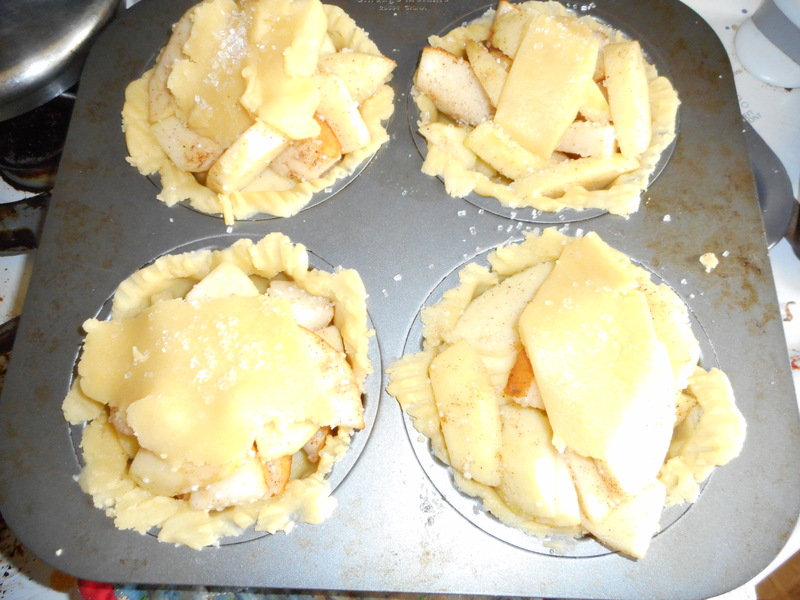 Place in the oven and bake 40-45 minutes or until bubbly, lightly browned and a fork goes through the apple slices easily. Cool at least 20 minutes. Serve warm or cold. Enjoy! Who doesn’t love a banana split? I remember when we were first dating Joe and I would often share one for dessert. I like them not too gunked up with sprinkles and the like but hot fudge is a must on my banana split. Sometimes I am not in the mood for bananas and I looked for other fruit to make into an ice cream duet. One that seems to pair well is the pear! 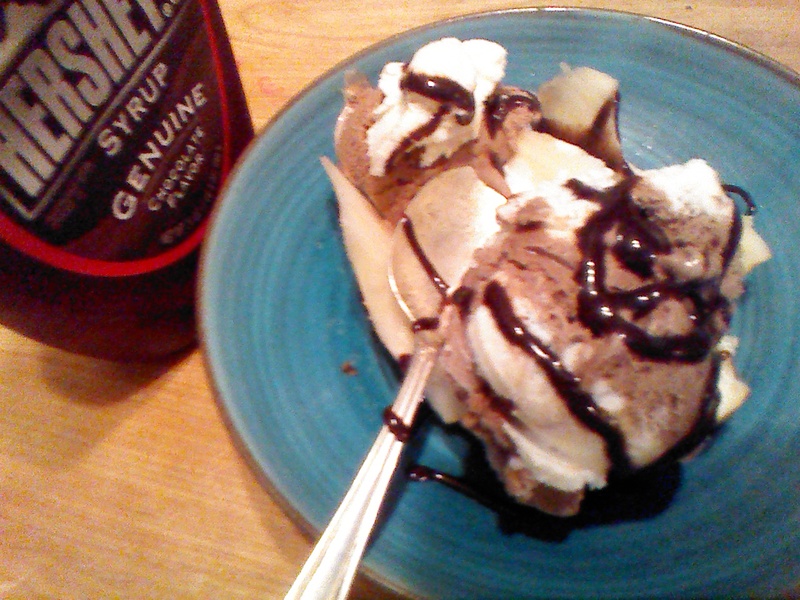 I think a ripe bosc pear is fantastic split in half and made into a modified banana split, sans the banana of course. Other types of pears would work, just make sure they are at the peak of their flavor and texture. Here is how I do it. 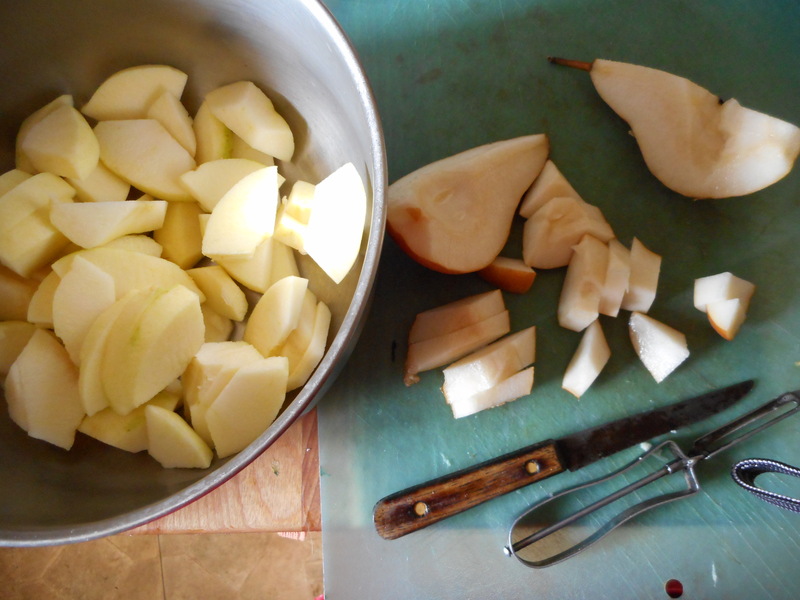 Take one large ripe pear, cut it in half and then into quarters. Remove the hard seed area in the fat part of your pear. You can use a melon baller for this process or a sharp paring knife. I lay the pear wedges in my chosen dish. I happen to have a couple of elongated frosted glass dishes with low sides that were made for banana splits. Top with 2-3 balls of ice cream. I like to use vanilla or vanilla fudge but strawberry is also a great choice and if you are a chocoholic, indulge by all means! Friendly’s makes a fantastic ice cream called “Banana Split” which is three flavors: banana with fudge ripple, chocolate with walnuts folded in and strawberry with flecks of crushed pineapple. I am guessing it would go rather well in my pear split. I heat up some hot fudge; there are a number of good jarred hot fudges out there. Read the label if you are concerned about GF issues. It would be sad to get sick from such a fantastic dessert. Put a couple of dollops of it on there. I also like a delicate stream of Hershey’s chocolate syrup poured over the top. If you are a lover of nuts; throw on some lightly salted peanuts or what ever floats your boat! Again, check the label for GF safety. I don’t generally put whipped cream on it anymore, counting my calories but if you must: whip up some heavy cream, add a spoonful of powdered sugar and a dash of vanilla extract (GF of course) and spoon it on top. I am not a fan of maraschino cherries but put one on if it is important to you! Note: if your pear is kinda firm you can poach it in some liquid; cider or wine, even cranberry juice; just until soft. Cut in half and remove core and slice and use as the recipe suggests. The quality of your fruit really matters. Don’t use mushy or hard fruit and if it looks sub par, cut up, cook it and use as a sauce on your ice cream or make it into a cobbler. I wouldn’t use it in this recipe. Same goes for ice cream. Don’t use less than the best. I personally love Turkey Hill, great mouth feel, the sweetness level is where I like it and the flavors are perfect. I couldn’t take a picture of my first pear split as my camera is missing in action and I didn’t think of using my cell until I had devoured the whole split! This second split (one day later) is okay, it is missing the wonder of hot fudge…I am all out. Bummer, although it was still tasty. The beauty of this dessert is that you can enjoy some ice cream relatively guilt free as you are having fruit too! Plus, if you are not a banana lover this is a great option for a split. I have even made it with peaches or nectarines in the summertime. Give my pear split a try, why should bananas have all the fun?